If you're going to survive, you're gonna need water, and if you have a family you're going to need a lot of water. There's lots of commercially available options out there for lots of money. Or you can build your own out of items you can pick up easily and assemble with just some simple tools. This is my two stage filter that I built, total cost for parts, was about $120 minus shipping for some of the items I ordered. Parts List - Some of the stuff came from Lowes, some from Amazon, some I had lying around. But that list should get you started. Instructions will be on subsequent posts. 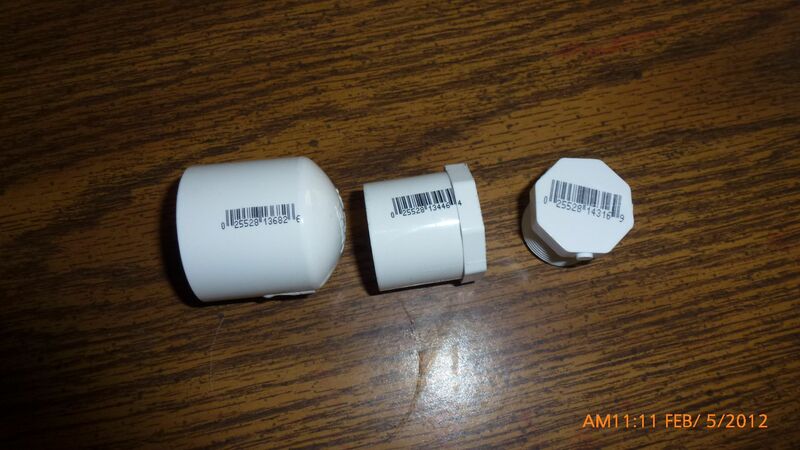 Step One: Assemble your Primary Filter Canister. Take your nylon screws and nuts and put them through the grate that will be at the bottom of your canister, I capped them off with some clear silicone. 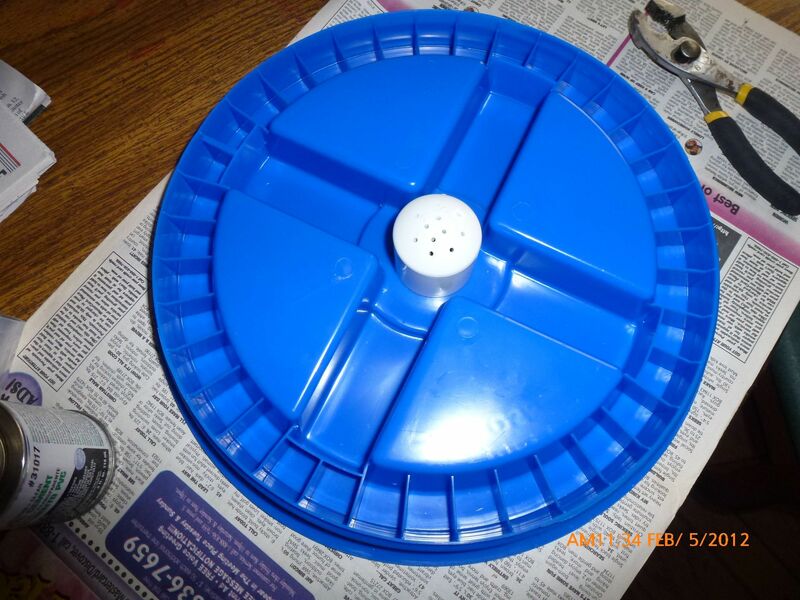 Assemble the parts using PVC primer and glue. 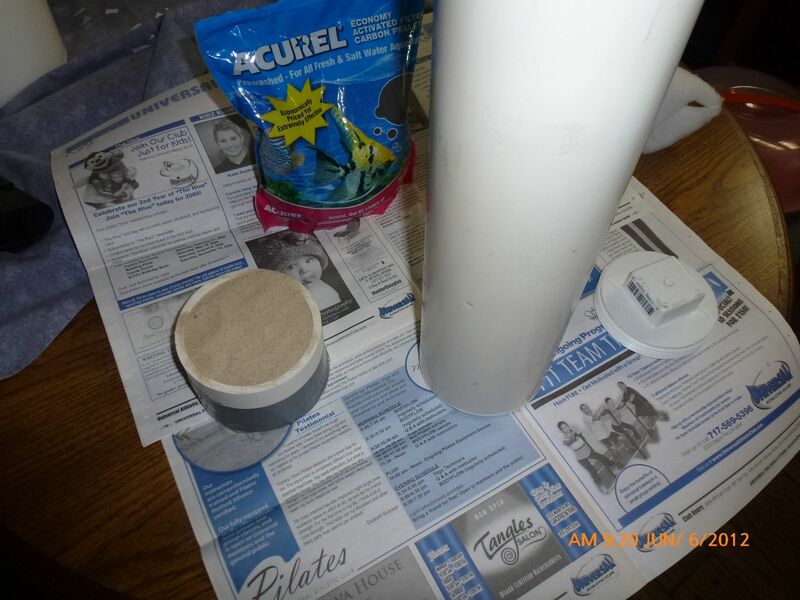 Allow the glue to set before packing the filter media. 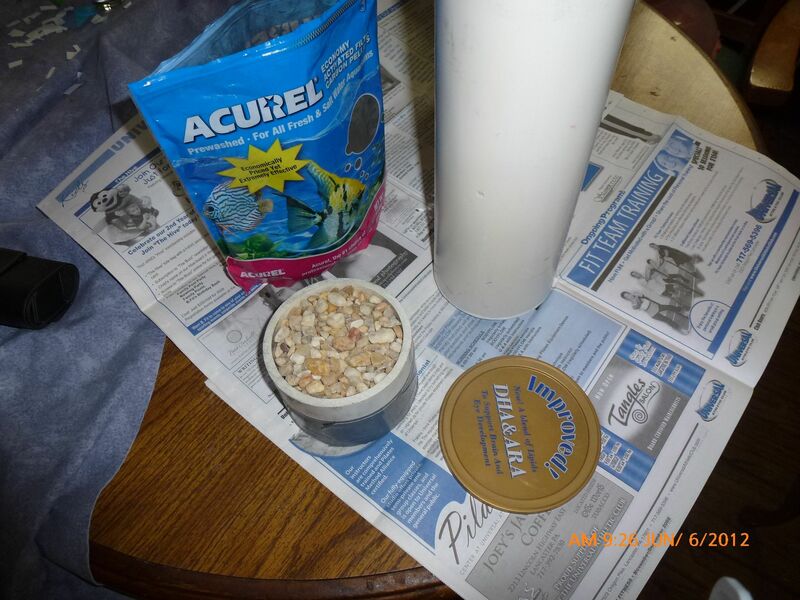 Step Two: Preparing to pack your filter canister. In this picture are some parts that I assembled/modified just for this project. 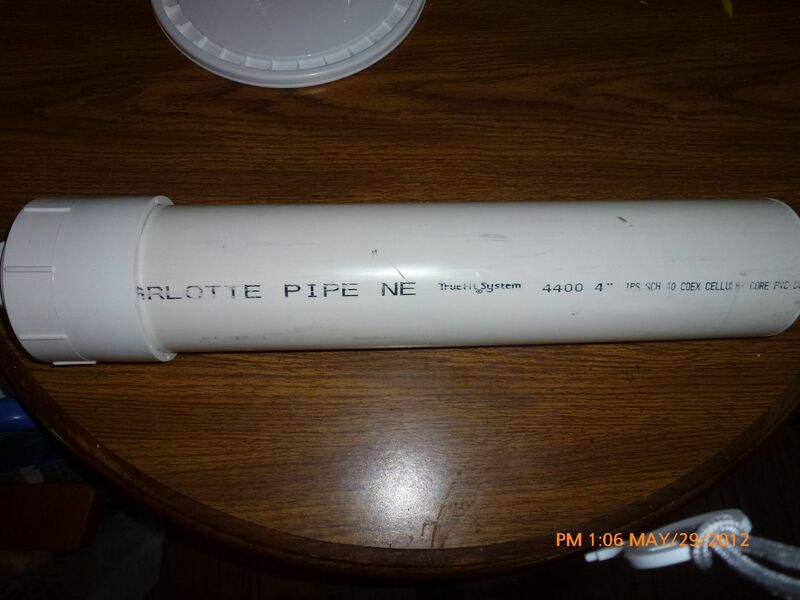 The part in the back is a piece of PVC pipe that I cut to exactly 3" high, capped off the bottom with just a piece of plastic cut from another bucket and then taped up. This is my fill cup for the layers of media that's going inside the canister. 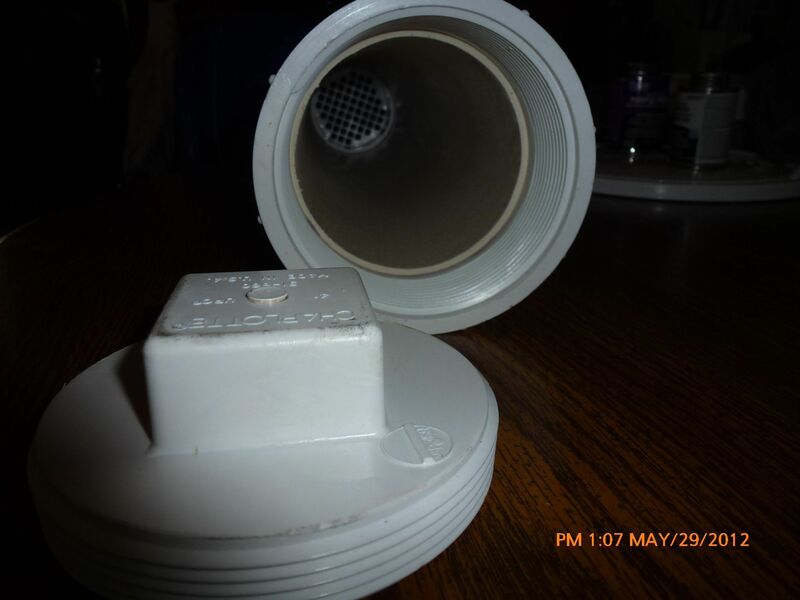 The part on the left front is the same type of grate that was used on the bottom of the canister, but I trimmed off the flange and sanded it down so it would fit inside the canister. 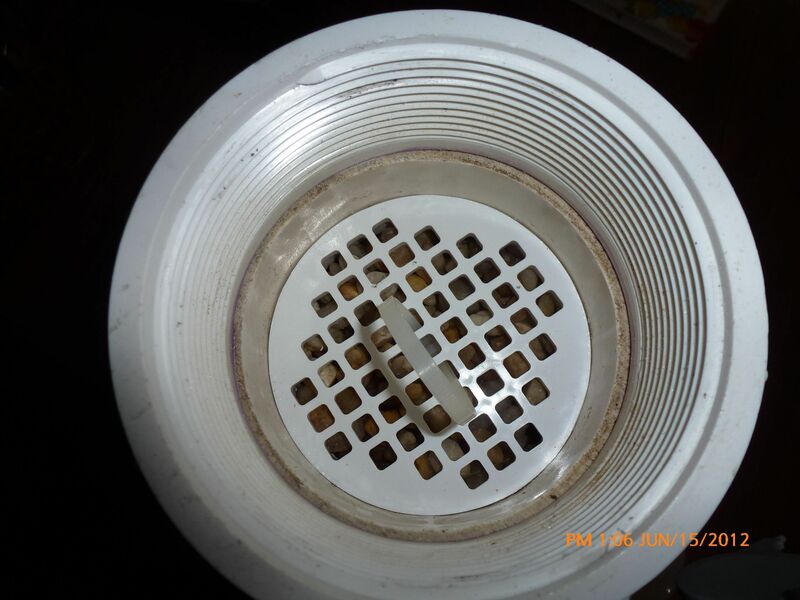 The last part is again the same type of grate with the flange trimmed off, but in this case, I also removed most of the other material so it's just a separator between layers. I put in the zip tie so that it could be easily removed. 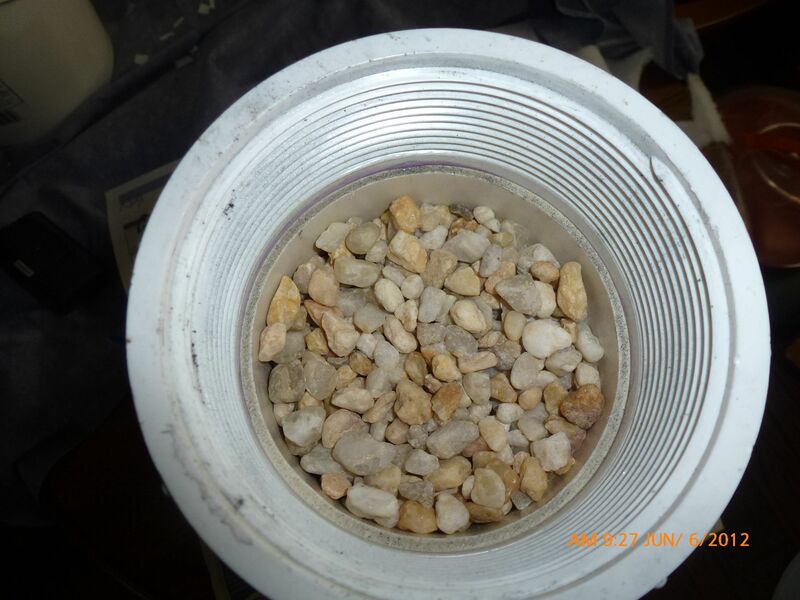 This is some filter material like you'd see in a fish tank, it was placed at the bottom of the canister for the pea gravel to lay on. I used 3" layers of media to pack the filter. Here's the layout. 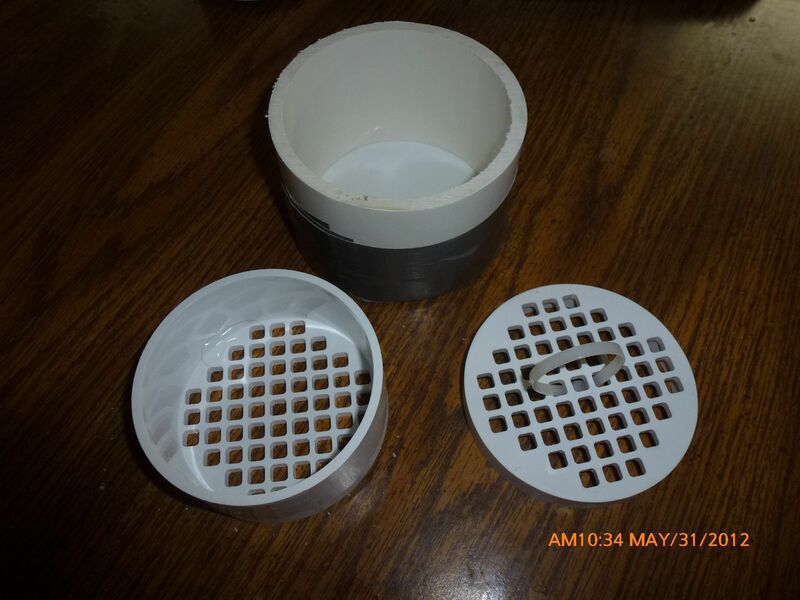 I used one of the grates that I modified as a cup to hold the top layer of pea gravel so it could be removed easily if the filter needed repacked. I then added one more trimmed down grate to hold the pea gravel in place so that the filter can be turned or stored horizontally without anything spilling. The filter is then capped by the clean out type plug. 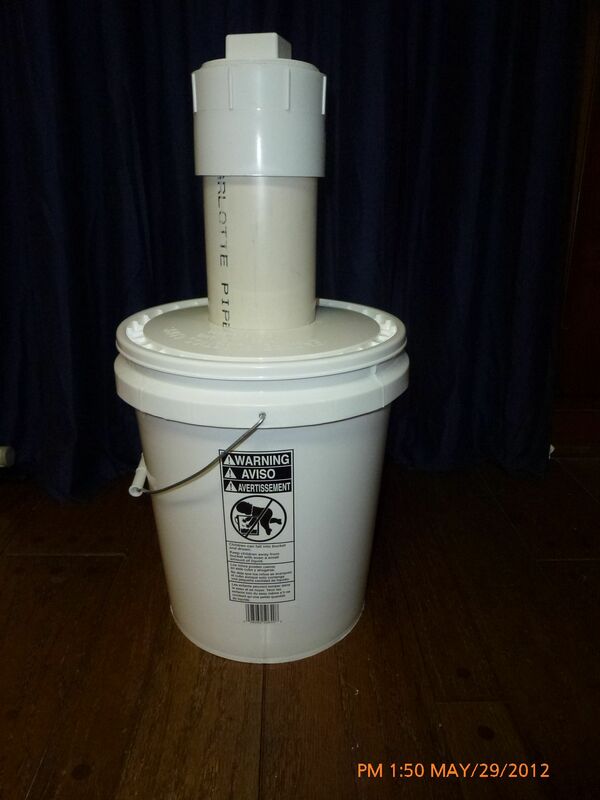 I used a 5 gallon bucket, but I'd recommend getting a 7 Gallon bucket if you're going to build one yourself. 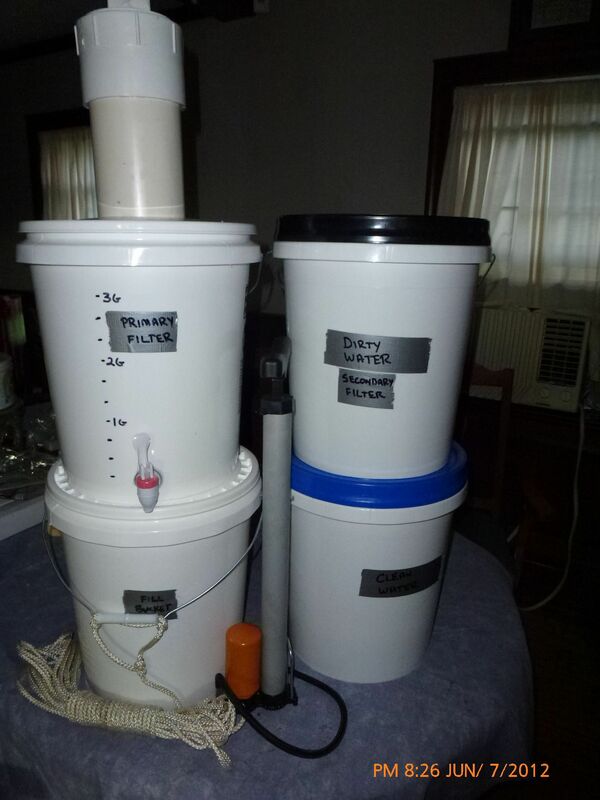 The reason why is that the volume of the filter canister is 2 gallons, so if you want a full 5 gallons to flow into the second stage filter, you'd want the 7 gallon. 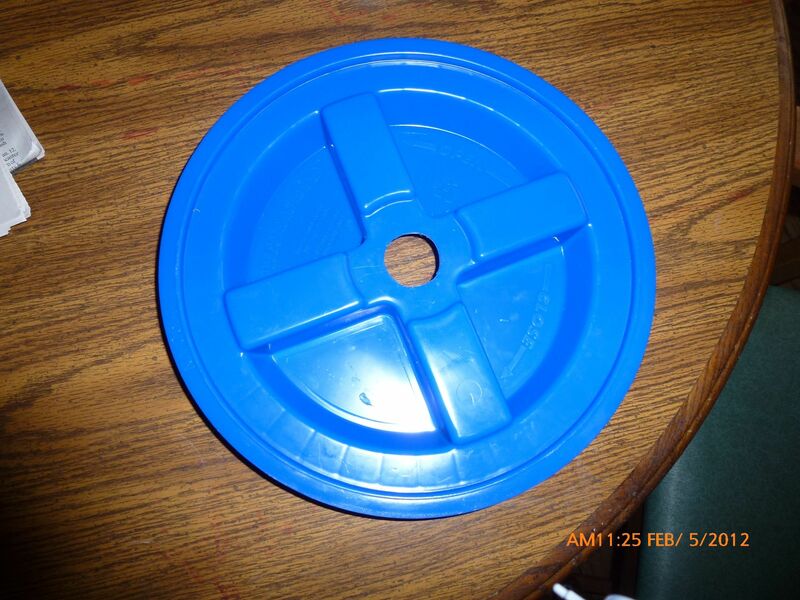 I'm just using the regular snap on bucket lid and cut a 4" hole in the top. I just happened to have a 4" hole saw handy, so I made pretty short work of that. I mounted the spigot about an inch off the bottom, and sealed with rubber O-rings and clear silicone. 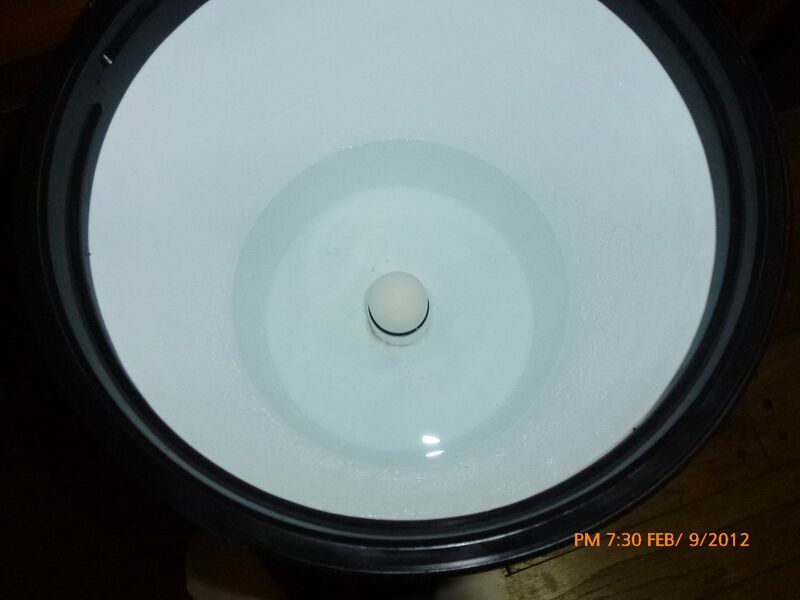 I wanted a way to easily see the level of the water in the bucket, so I drilled a 1/4" hole in the bucket and set a flashlight there to illuminate the inside. I put hash marks at 1" increments. 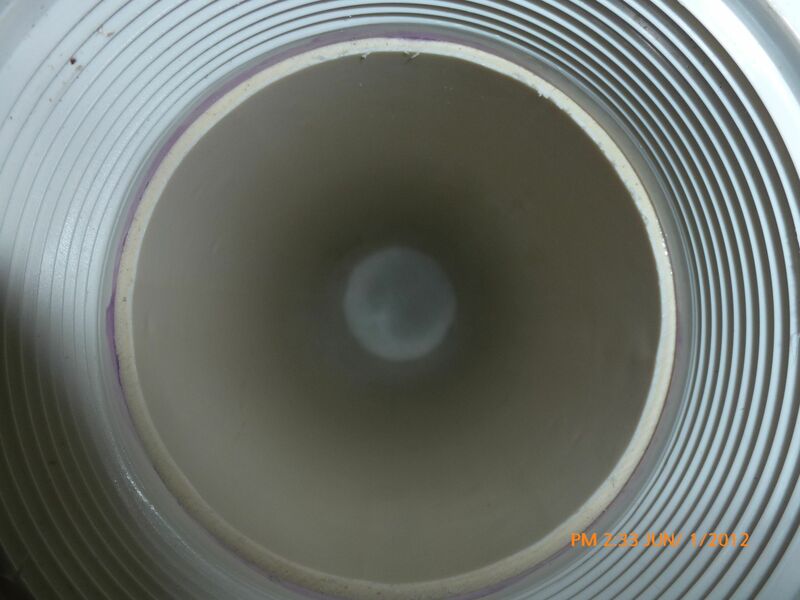 The water from Stage One is meant to flow into another bucket, where the water will be further filtered. 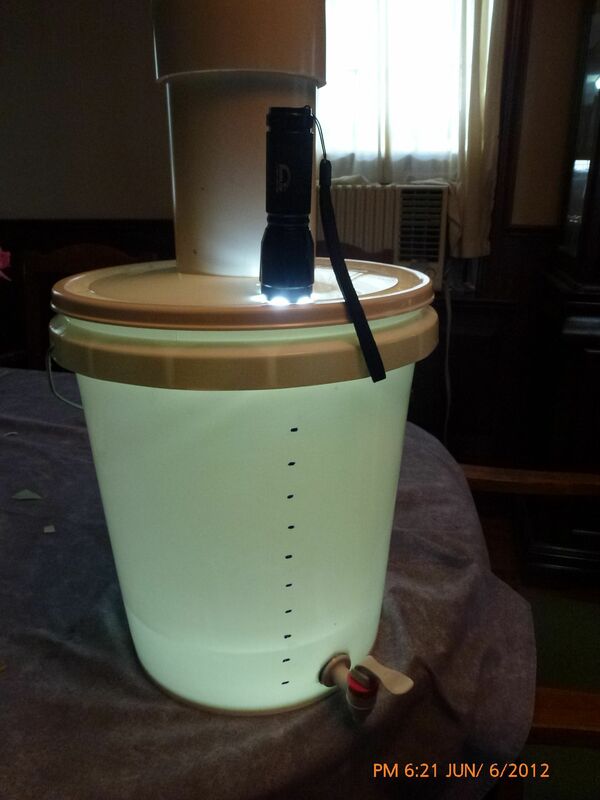 The water from Stage two flows into your clean water bucket, with instructions to come later. 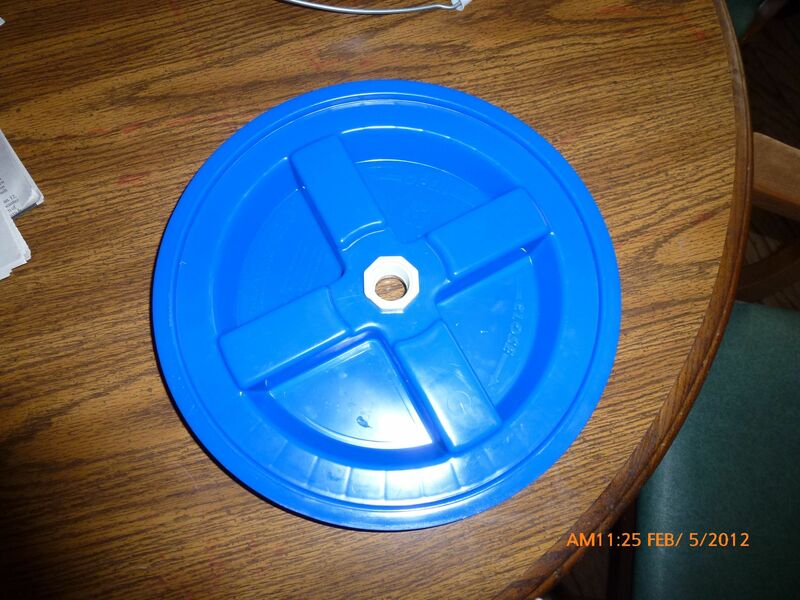 You'll need some parts, a 5 gallon bucket with a gamma seal lid, I used a black lid to indicate that it's dirty water. 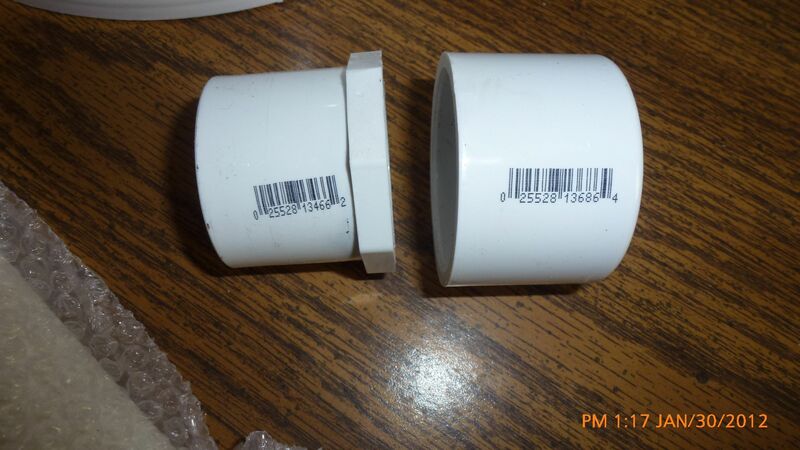 You'll also need the two PVC parts in the picture below. 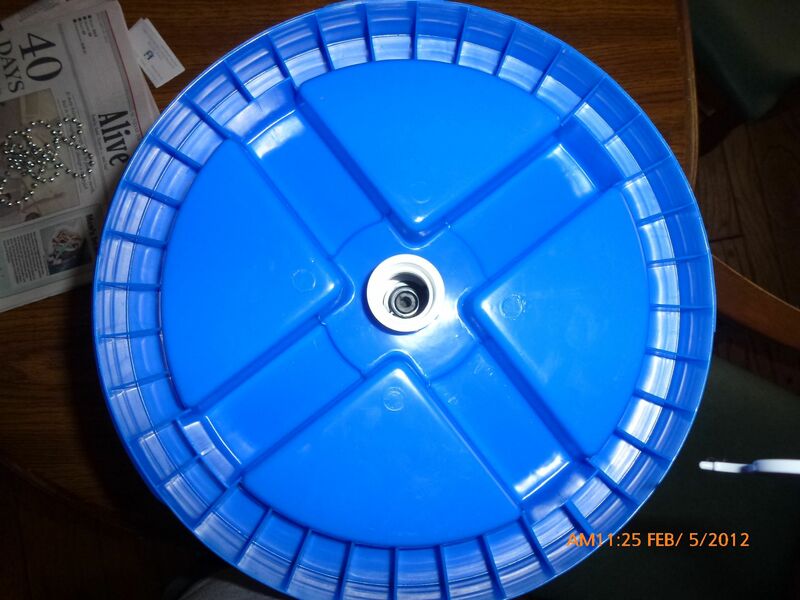 These parts are used to raise the filter off the bottom of the bucket, and allow a "Silt well" at the bottom. 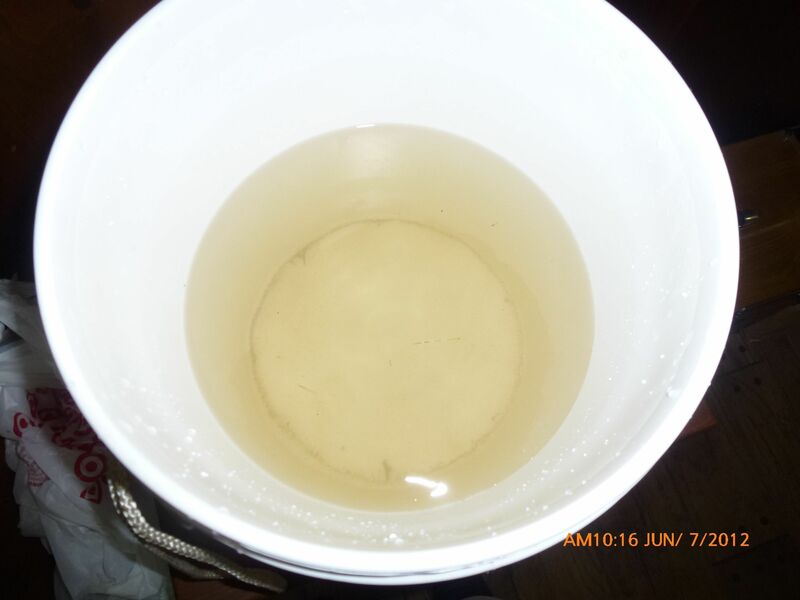 As the water filter, any silt that might be left in the water will settle at the bottom below the filter. Water that collects there may then be poured back through the first stage filter. 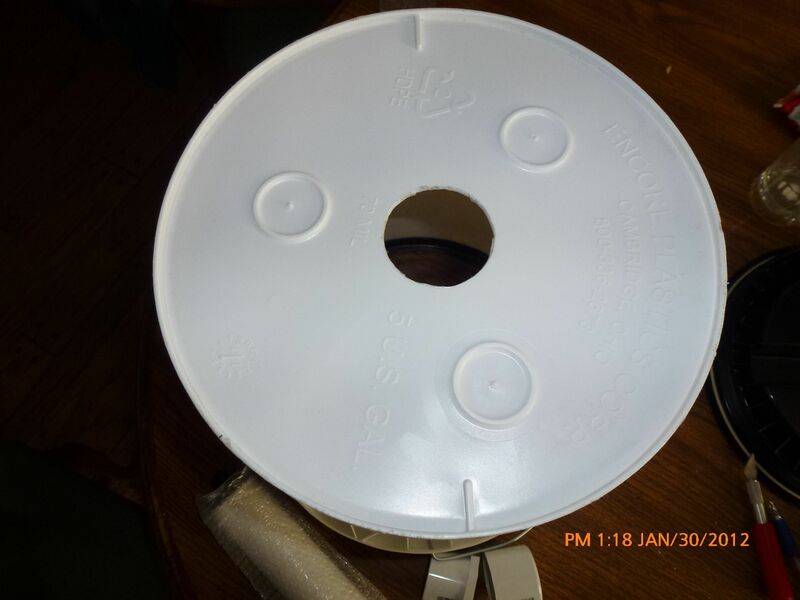 Cut a hole in your bucket for the for the part on the left of the picture above to fit snugly through. 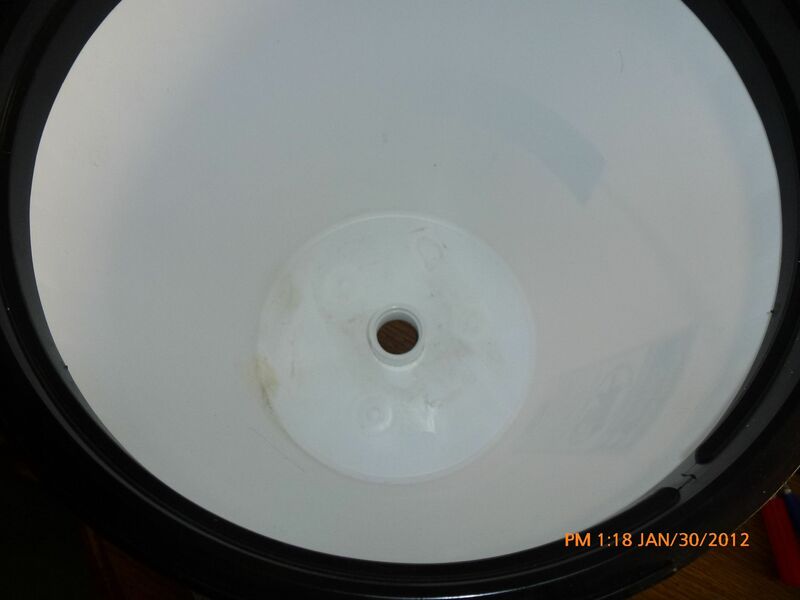 Run a bead of clear silicone around both sides of that part where it meets the bucket, and then get your next piece that has had it's top sanded smooth and use some clear PVC Primer and PVC Glue and press it down tight onto the piece on the bottom of the bucket. 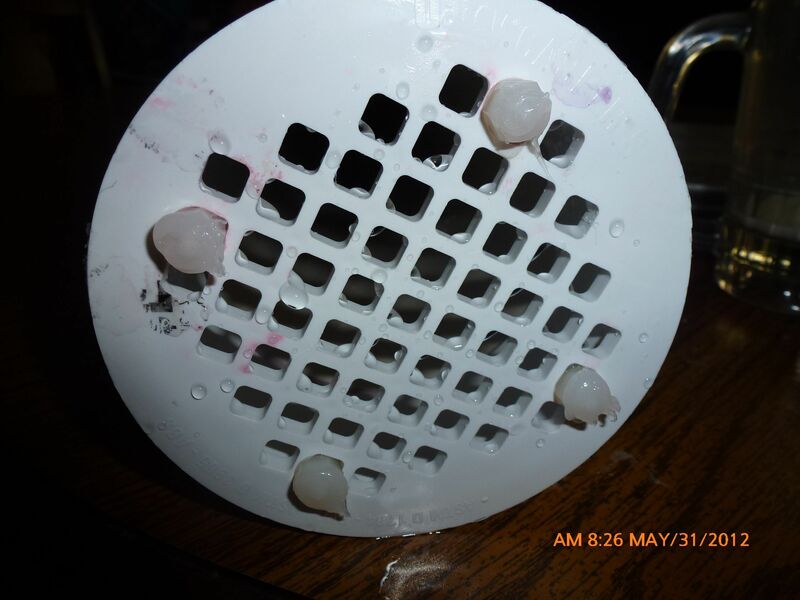 I also added another bead of clear silicone around the bottom of that part once the glue was set. Attach your filter, and give it a leak test. 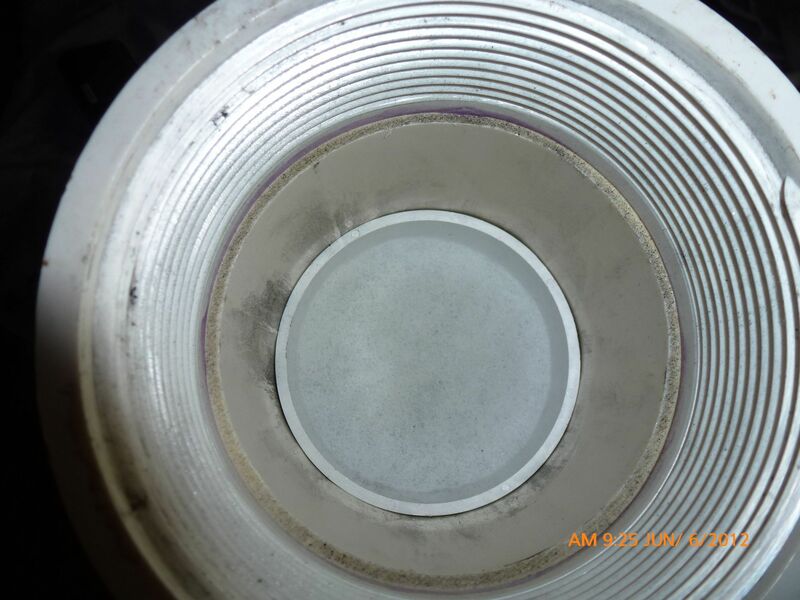 Get your tire valve, and drill a hole into the lid of the gamma seal for the stage two filter. 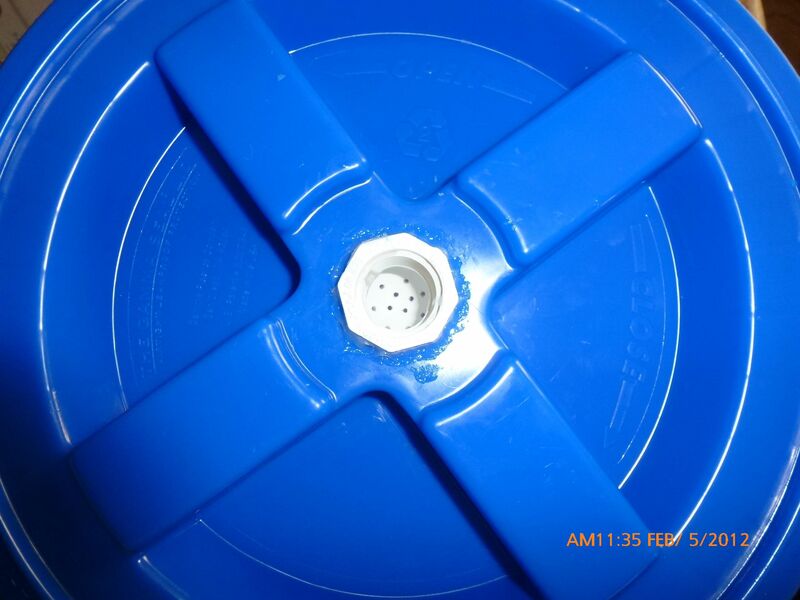 Insert your tire valve so you can add a little pressure to the container. This will increase the filter speed. This is fairly simple. 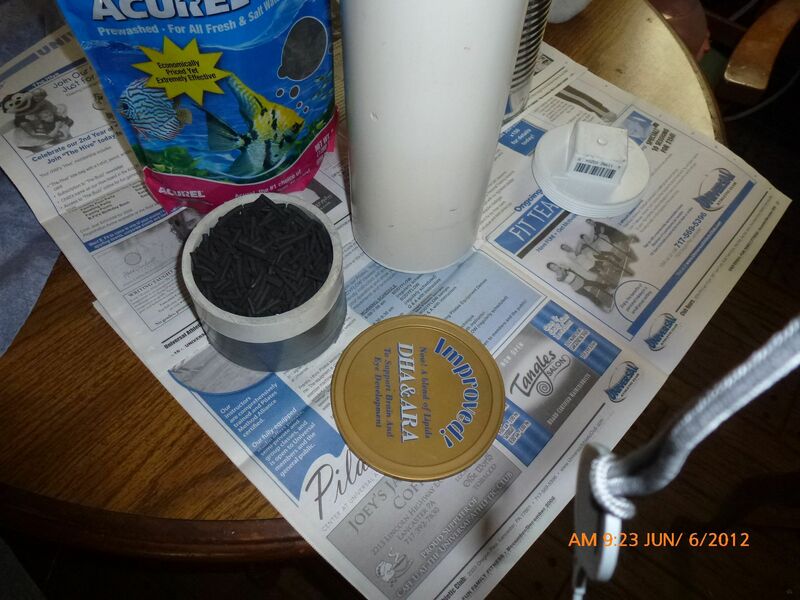 You'll take one of your 5 gallon buckets and attach your Gamma Seal ring, I used Blue to indicate clean water. The middle part, you'll drill a few holes in it. 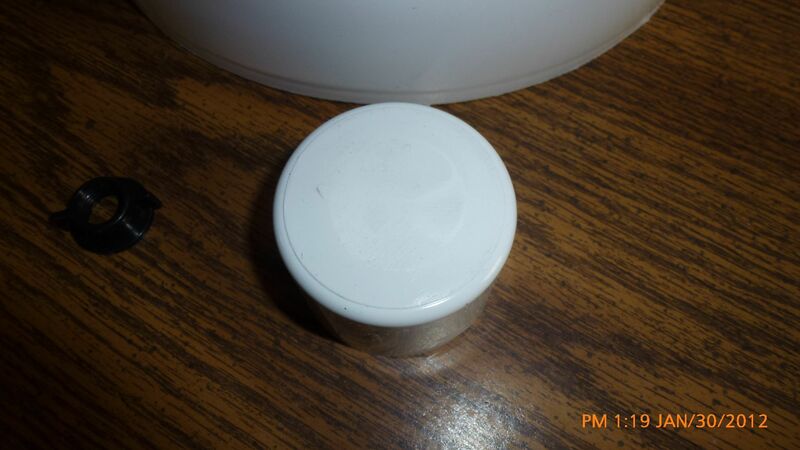 Next cut a hole in your gamma seal lid that fits the in the middle snugly. 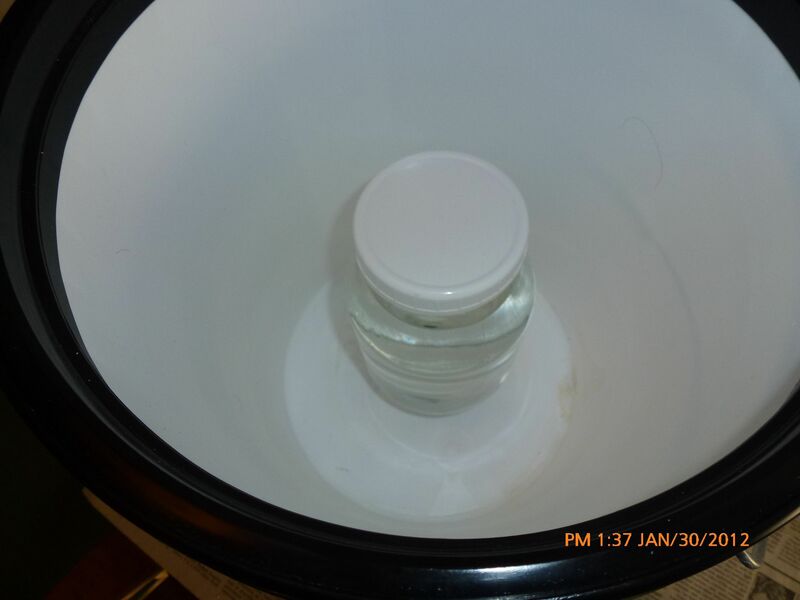 Put a bead of clear silicone around the piece of PVC and fit it through the lid. 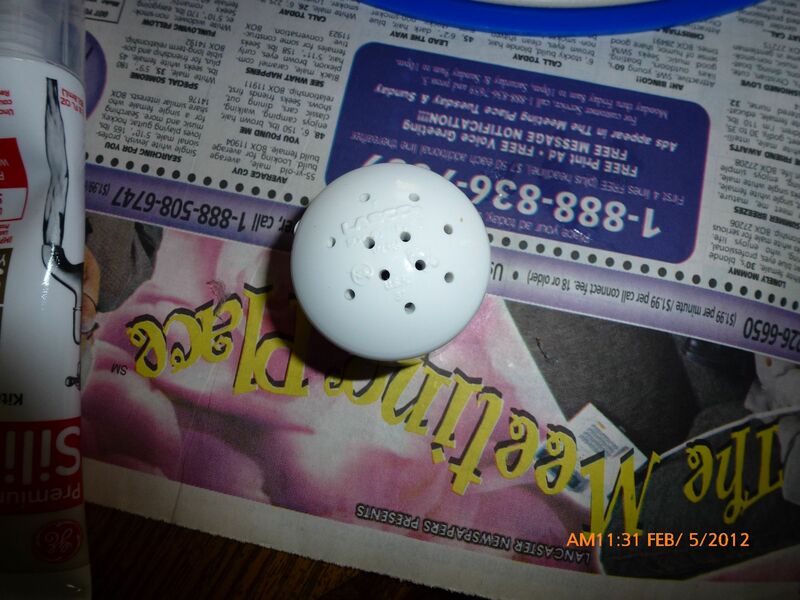 Use your clear PVC primer and glue and attach the piece that you drilled holes in. 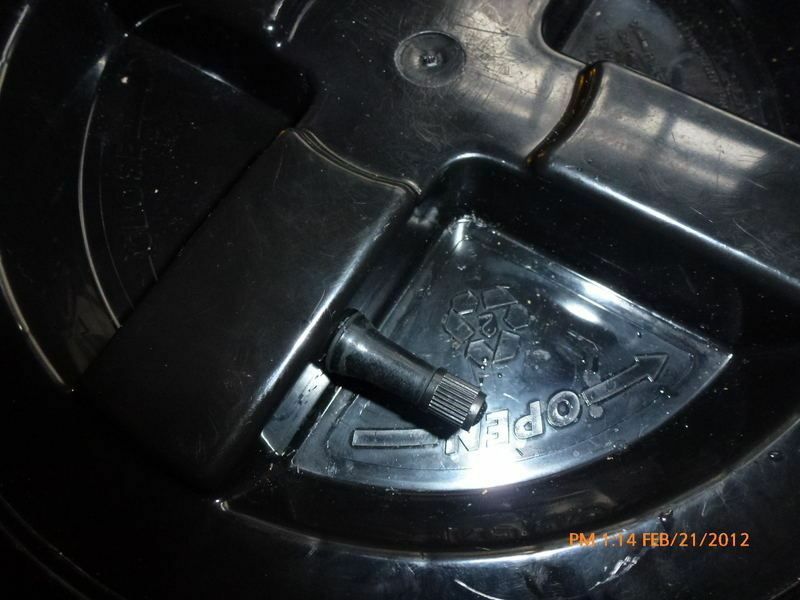 If you did everything right, you should be able to place this lid in alignment with your stage two bucket and the outlet of the filter should line right up with this part. 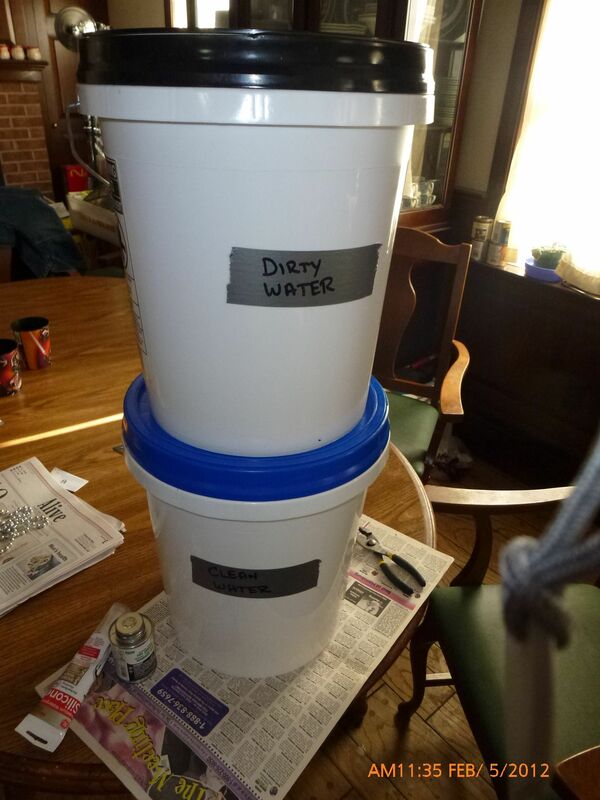 The buckets will sit together nicely and not allow any junk to fall into your clean water. I have tested the full system and ran some pretty cruddy water through it drank the finished product. It had no foul taste, odor or color. 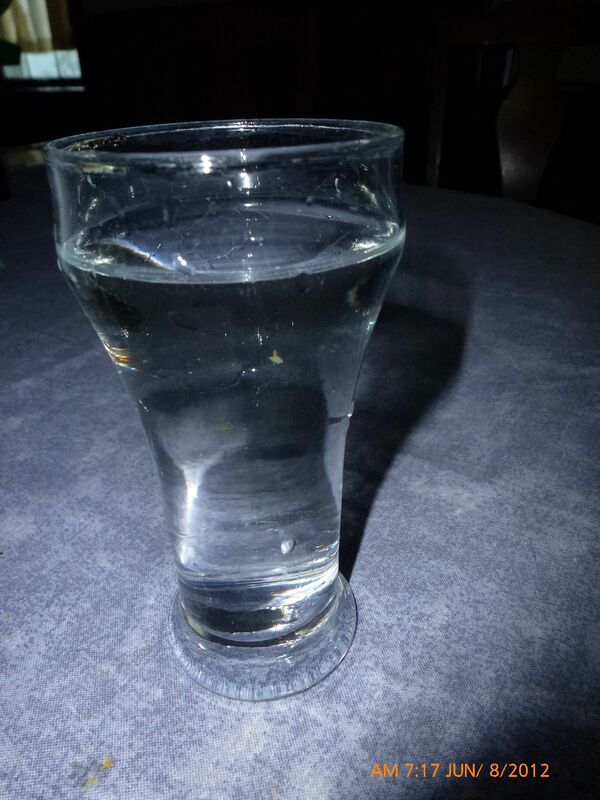 It just tasted like pure water. One more thing in reference to the tire valve added to the stage 2 filter bucket. You'll only need to add a couple of pounds of pressure to the bucket, that's why the bicycle pump is in one of the first pictures. This is a short video I shot of adding pressure using my air compressor. You can see the flow is faster with a little bit of pressure. I believe it still does remove the same amount of bad stuff, I wouldn't see any reason why not. 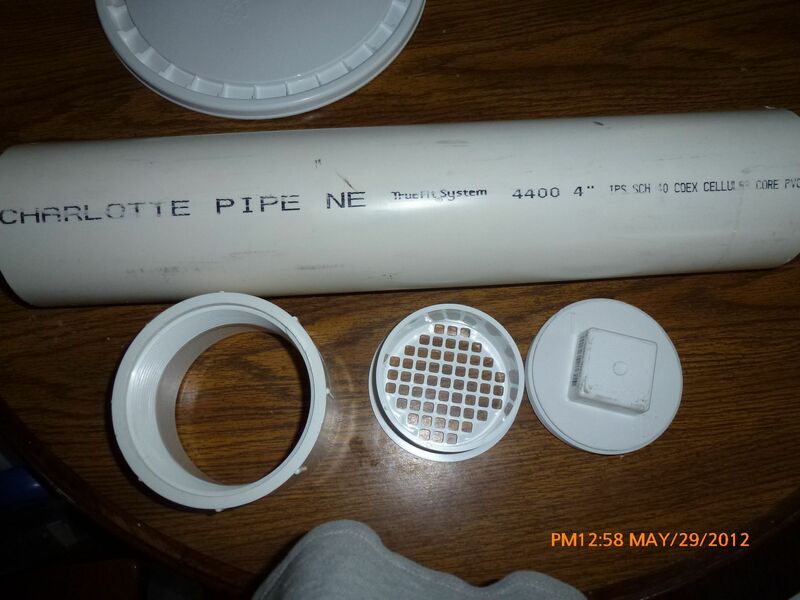 The aperture size of the filter remains the same regardless of the pressure, and the water still has to make it through the rest of the medium. As for salt, I don't know. It's not listed on their list of stuff it removes, so I honestly cannot say. It might not be listed there because overall, a little bit of salt in the water isn't necessarily bad for you. I'm not sure if using this system to run ocean water through would be a good idea. I'd say if you had to use ocean water, then that could be done through a distillery, since the water would evaporate and leave the salt behind. Quick research and then I remembered: You can get a reverse osmosis filter to remove salt from the water. Start there, that should give you some off the shelf options. You should sell these things.